Susan Elia MacNeal introduced the remarkable Maggie Hope in her acclaimed début, Mr. Churchill’s Secretary. Now Maggie returns to protect Britain’s beloved royals against an international plot—one that could change the course of history. As World War II sweeps the continent and England steels itself against German attack, Maggie Hope, former secretary to Prime Minister Win Susan Elia MacNeal introduced the remarkable Maggie Hope in her acclaimed début, Mr. Churchill’s Secretary. Now Maggie returns to protect Britain’s beloved royals against an international plot—one that could change the course of history. 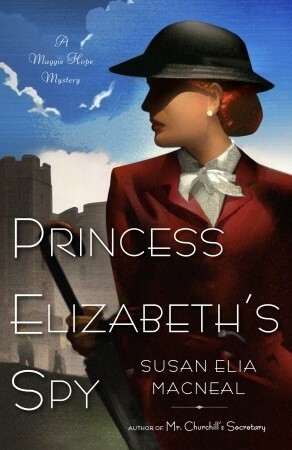 As World War II sweeps the continent and England steels itself against German attack, Maggie Hope, former secretary to Prime Minister Winston Churchill, completes her training to become a spy for MI-5. Spirited, strong-willed, and possessing one of the sharpest minds in government for mathematics and code-breaking, she fully expects to be sent abroad to gather intelligence for the British front. Instead, to her great disappointment, she is dispatched to go undercover at Windsor Castle, where she will tutor the young Princess Elizabeth in maths. Yet castle life quickly proves more dangerous—and deadly—than Maggie ever expected. The upstairs-downstairs world at Windsor is thrown into disarray by a shocking murder, which draws Maggie into a vast conspiracy that places the entire royal family in peril. And as she races to save England from a most disturbing fate, Maggie realizes that a quick wit is her best defence, and that the smallest clues can unravel the biggest secrets, even within her own family.